Happy Monday! Today I have teamed up with my good friend Laura from Walking In Memphis in High heels and 4moms to giveaway ONE 4 moms Breeze playard! We have gotten tons of use out of our Breeze since having Andi. I would say this in on my list of top 5 things that we got for Andi. We have used it next to our bed for her to sleep in the top bassinet part. And now that she is bigger and sitting up all by herself we use it for her to play in. She loves to play in it and I love it because I know she is safe in it. She is starting to move a lot and she puts everything in her mouth so this has been great. It is also great for traveling. It is so easy to set up and take down that it has been great to use when we have gone out of town. She sleeps in it really well. The giveaway will run for one week and One lucky reader will be chosen at the end of the week. To enter use the rafflecopter widget below. And be sure to check out Laura's blog. Her daughter Leighton is the cutest! Good Luck! I have a 3 month old, and have been looking at this play yard! We would get lots a great use out of it! Would love this for my 3 month and a definitely must have for our next! My son just turned 2 months and is starting to play with toys.. would love this as he gets older! My favorite 4moms product is the tub.. we love using it everyday for bath time. His favorite time! I love my 4moms infant tub! I would love this play yard it's adorable! would love to try the mamaRoo for baby #2! The playard is so cute! My best friend just had a baby, and I adore helping out with my little niece! She would love the playard. We are due with out first baby in December and we have been eyeing this playard. I love 4moms products! my favorite 4moms is the playard for sure!!! I love the infant tub!! It has to be the playard or the stroller with the push to open and close!!! I love the simplicity, quality and style of 4moms products! Would love the 4moms playard. Would love this for my 7 week old! She loves her Mamaroo. So far we love the infant tub!! But would love the play yard and a Mamaroo!! The Breeze is definitely my favorite- seems to have the most versatile. I love the origami stroller. I am having my first baby this fall and have no idea what I really need! I think I would get most use out of the playpen or the bouncer. We love the mmamaroo and the bathtub spout cover! I have been wanting the breeze though and am due in a week with baby #2! We just had baby #2 (she is a week old today) and we are using the one from my first daughter 3 years ago. This was not around then and this would be wonderful to replace the one we are using in our bedroom for baby #2 to sleep in. The 4moms mamaRoo is my favorite, my 3 month old loves it! the mamaroo is so cute! Andi is absolutely adorable playing in her Breeze! 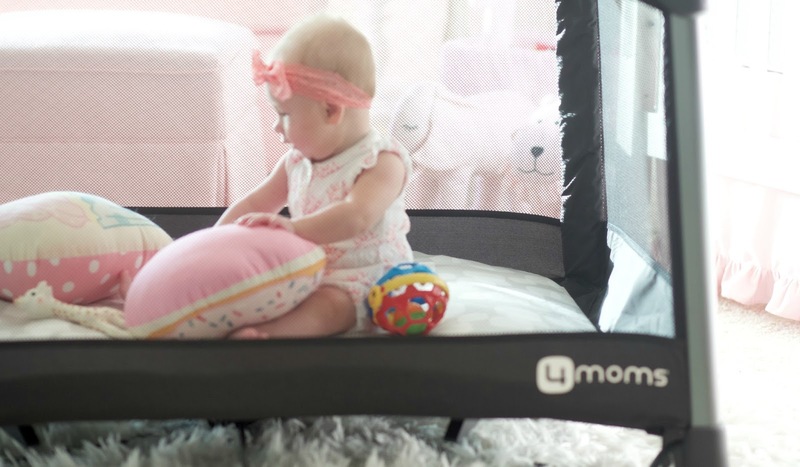 Would love this for my baby girl 4 moms products are great! Super excited to see the bounceroo! love 4moms and have a hard time choosing a favorite! My favorite is probably the mamaroo seat! I have heard great things about this play yard! Would LOVE to have one! I love the momaroo swing for my nephew! I registered for the mamaroo! I love the play yard! It would be awesome to have one!! I loved the mamaroo and 4moms tubs with my first but the origami is my dream stroller! I've read so many great things about this! I'm due in October and would love to win one, it'd definitely get a ton of use! We'd love this for our lil' lady coming in October! They are all my favorite! I'd be so appreciative to get anything from them. Love the Breeze & MamaRoo! Our son is 2 months old and were in the process of moving, so this would be absolutely perfect to keep him in as we move out and then move into our new home! Due with my first in September and would love to win this for my little one! 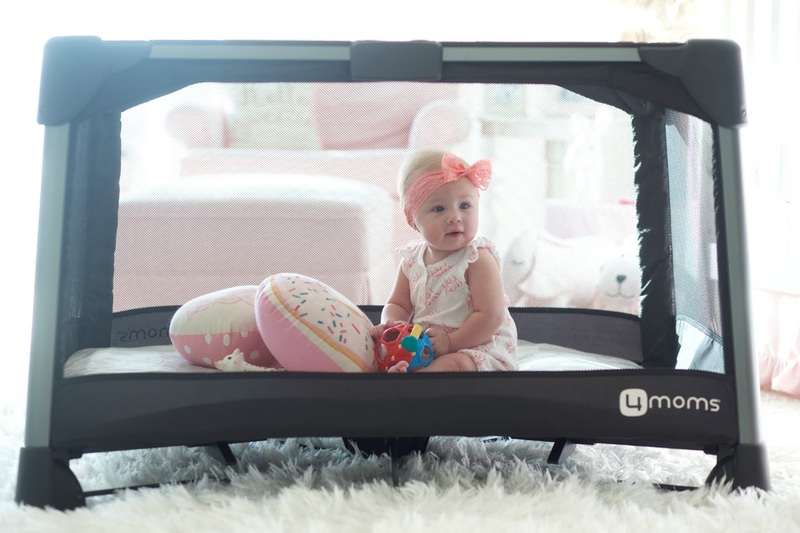 I have heard such great things about 4moms products, this play yard and the mamaroo in particular but do not own any of my own yet! I am in love with my Mamaroo! 4moms makes such good products. I would love this or the mamaroo! We love the mamaroo for sure! I'm obsessed with the Rockaroo! I can't wait to get one for our little guy! Would love the play yard for baby number 2!! Would love this for my 4 month old! We love the 4Mom's bath tub! It's a great looking product & having the temperate gauge built in takes away the stress of guessing. We would get so much use out of the playard!! 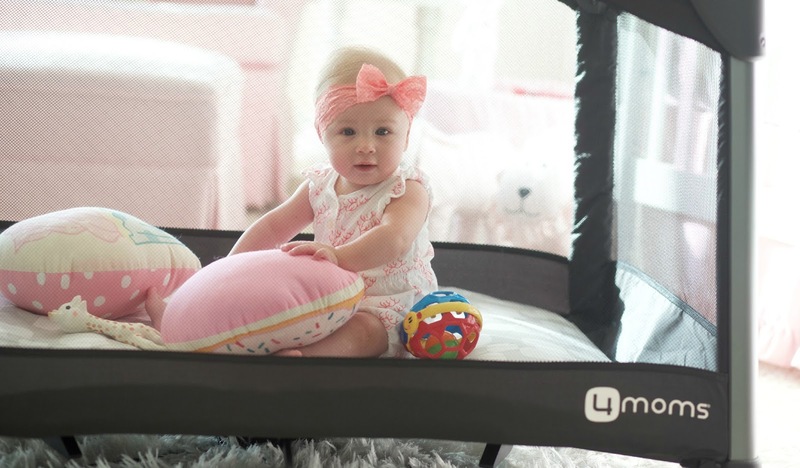 I love all of 4 moms products, but my absolute favorite is the mamaRoo! This play yard would be so awesome for my little one, due in October. I love all 4moms products, but I think I am most excited about the mamaroo. I know I can trust anything from 4moms to help us create a safe, loving nest for our coming bundle! Love, love, love! This would be perfect for baby #2! I LOVE 4moms products! We have a mamaroo and as a mama of 2 it's so great when I need my hands free to help big sister! Our 3 month old seems to love it more and more each week. It's great! I've had my eyes on the breeze play yard! I would LOVE it for travel!!!! We are having our first in November and have been eyeing this for traveling during the holidays! We love the mamaroo. It was a lifesaver with my first babe! My son is just a few days younger than Andi (1/8) He just started sitting up and this would be great to have for the same reason you use it for Andi. We are going to Florida in September and this would be great to have on our trip for easy set up anywhere. Registered for the 4moms Mamaroo! Would love to add this to the nursery. The mamaroo looks so cool! Would love to win this for my baby girl. Such cute photos of your gorgeous little girl! I adore the mamaroo, but I would love to try the origami & the breeze. That Breeze play yard looks amazing! We have the mamaroo by 4 Moms and Wyatt loves it! So if he's anything like his mama and her allegiance to certain brands, he'll love this too! We love our Mamaroo and our bathtub from 4moms! Thank y'all so much for doing this great giveaway! I love all of 4moms products - they are so innovative. I really like the breeze play yard and mama roo. Very nice site and sturdy looking products. I would love to give this to my sister who is pregnant with her first child! The Mamaroo looks terrific as well. This play yard would be so perfect...I am crossing my fingers. THanks so much for the chance. These pics are just precious! I love my rockaroo and so does my son!! Yay for being able to make dinner!! I would love this for my daughter, Layel! She's become quite mobile and it would be nice to have a playpen to put her in while I do chores!! I am expecting my first baby, a baby boy, this November!! The breeze and mamaroo are definitely on the list!! I'm in love with the 4moms brand because it's all perfect for NYC living! I love all of the 4moms products!! All unique and very versatile and useable!!! We would love the play yard! Love your blog!! Your daughter is just adorable! We just had our2nd kiddo and I've become obsessed with the 4moms products. I tell all of my preggo friends how much we LOVE our mommaroo and tub and how much I wish I had had them with our first. 4Moms really has done an amazing job in making moms more confident and life less stressful. My favorite 4moms product is the mamaroo! I love all their products! We have the 4 moms mamaroo and the bath tub and LOVE both!! My favorite 4moms product is the mamaroo and also the 4moms tub, they are both amazing products and keep my family happy! HAPPY MOM HAPPY BABY and Vice Versa! the origami stroller, its just so cool looking! Love them all! The mamaroo is definitely a must! And would love the play yard also! I'm expecting my first is September and just added this to my registry. Would be wonderful to win one! I love the Mamaroo. Thanks for the chance. I love the mamaroo and its makes the perfect baby shower gift! So excited for this giveaway! I have the 4moms mamaroo and I am fighting the urge to squeeze into it myself. I can't wait to use it on our sweet baby in just about 9 weeks! I'm sure it will be a favorite! I am patiently waiting for my little Beckham's arrival in September, and I cannot wait to try out the 4Moms products with him! My favorite product is the Rockaroo swing. My favorite is the play yard! It would be amazing to win one! My favorite is the infant tub! I would love to have the playard. I just found out I'm expecting my first, so now I'm on the lookout for all the cool gadgets. This looks awesome, would love to win one! I need this for my office. It would be they perfect place for my little to play while I work! The 4 moms Breeze playard! We plan on traveling a lot to visit family and this looks like heaven to use! We are due with our first in December. I have been gushing over this and rockaRoo seat. My favorite product is the mamaRoo for sure, really want one of these!! I like the RockaRoo Seat. I really like the Origami Stroller but I would sure love to win the Breeze! I love all of 4moms products. Right now I would have to say the mamaroo is my favorite! My 2 month old daughter really enjoys it. I would love to have a breeze! The simplicity and ease of the breeze looks amazing. I have quickly learned simplicity and ease are necessities with a new baby! Thanks so much for the opportunity. I like the bounceRoo. It looks like so much fun. I LOVE the mamaRoo! My four month old son loves it so much! I would like to have the mamaRoo. The Mamaroo is my favorite! We have 9 kids and 9 grandbabies, this would be amazing to have when they come to visit us...Thank you and God bless. I like the Racaroo BIG motion, small size. My favorite is the mamaRoo. My favorite is their bounceRoo. I would love to have the bounceRoo seat. It looks so nice!